It is assumed that resistance to ionizing radiation, as well as cross-resistance to other abiotic stresses, is a side effect of the evolutionary-based adaptation of anhydrobiotic animals to dehydration stress. Larvae of Polypedilum vanderplanki can withstand prolonged desiccation as well as high doses of ionizing radiation exposure. For a further understanding of the mechanisms of cross-tolerance to both types of stress exposure, we profiled genome-wide mRNA expression patterns using microarray techniques on the chironomid larvae collected at different stages of desiccation and after exposure to two types of ionizing radiation—70 Gy of high-linear energy transfer (LET) ions (4He) and the same dose of low-LET radiation (gamma rays). In expression profiles, a wide transcriptional response to desiccation stress that much exceeded the amount of up-regulated transcripts to irradiation exposure was observed. An extensive group of coincidently up-regulated overlapped transcripts in response to desiccation and ionizing radiation was found. Among this, overlapped set of transcripts was indicated anhydrobiosis-related genes: antioxidants, late embryogenesis abundant (LEA) proteins, and heat-shock proteins. The most overexpressed group was that of protein-L-isoaspartate/D-aspartate O-methyltransferase (PIMT), while probes, corresponding to LEA proteins, were the most represented. Performed functional analysis showed strongly enriched gene ontology terms associated with protein methylation. In addition, active processes of DNA repair were detected. We assume that the cross-tolerance of the sleeping chironomid to both desiccation and irradiation exposure comes from a complex mechanism of adaptation to anhydrobiosis. 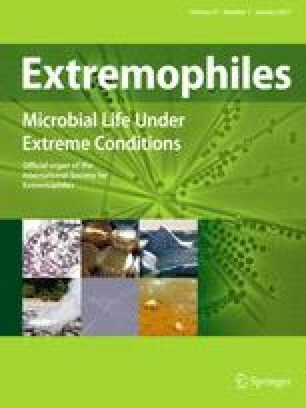 This article is part of a special feature based on the 11th International Congress on Extremophiles held in Kyoto, Japan, September 12–16, 2016. The online version of this article (doi: 10.1007/s00792-016-0888-9) contains supplementary material, which is available to authorized users. This work was supported in part by the Grants-in-Aid from MEXT/JSPS KAKENHI (Grant Number 16K07308, 25252060, 16K15073, and 15H05622) and a part of this study is also the result of the project “Characterization of the Mechanisms Underlying the Radiation Resistance Associated with Cryptobiosis” carried out under the Grant “Strategic Promotion Program for Basic Nuclear Research” by MEXT. Bioinformatics analysis was supported by Russian Science Foundation Grant for international groups (No. 14-44-00022).